slathered in a delicious cream cheese frosting! 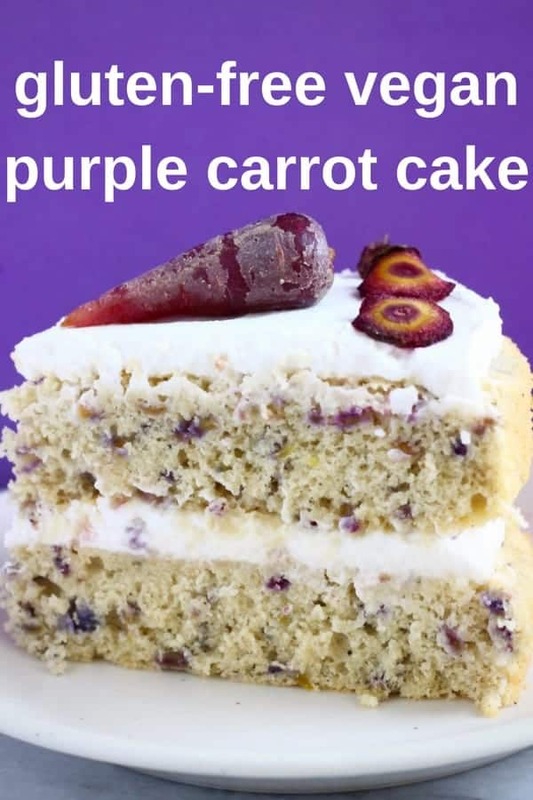 And now I’m moving onto this Purple Carrot Cake! Instead of normal carrots, I decided to mix things up and use purple carrots, because of their beautiful colour! Of course if you can’t get hold of purple carrots, this recipe will work just fine with normal carrots too. 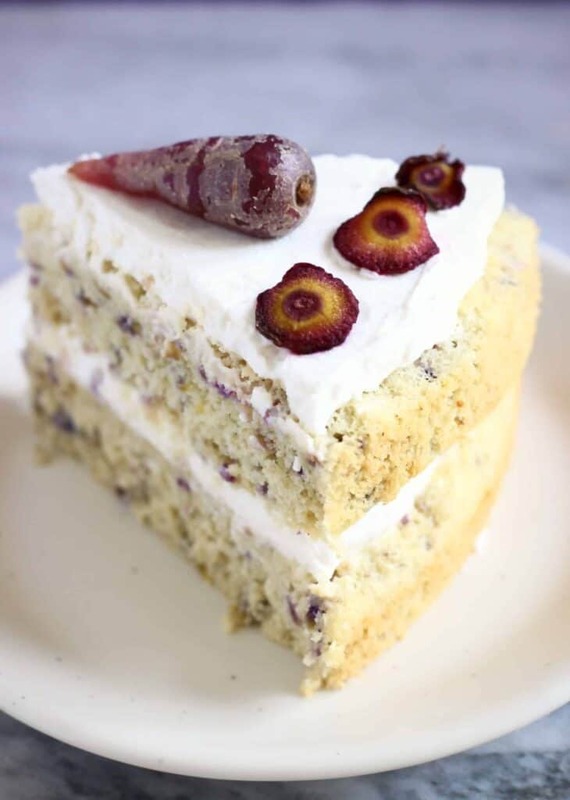 The base for this Gluten-Free Vegan Purple Carrot Cake is my go-to sponge recipe: it’s made in one bowl, uses familiar ingredients and is refined sugar free. You can add any type of dried fruits you like – whilst raisins or sultanas may be more traditional, finely chopped pieces of dried mango or papaya are also delicious. Chopped walnuts add a lovely contrasting bitterness, but these can also be swapped for any other nuts, or left out completely. 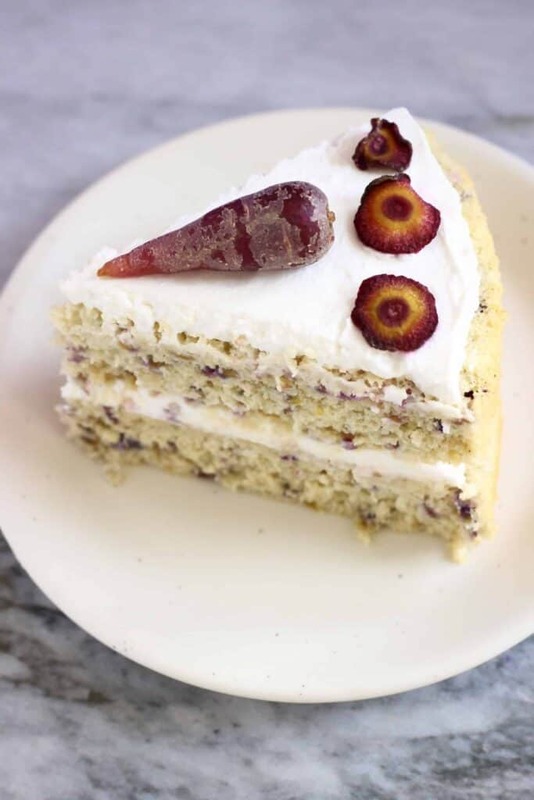 I also like to add some desiccated coconut for its sweet and fragrant nuttiness that pairs wonderfully with the warming spices in the cake, but you can also leave this out if you prefer. And what’s carrot cake without a rich, tangy, sweet cream cheese frosting? I like to make mine using creamy coconut whipped milk, lemon juice for sourness, and maple syrup for a little sweetness. 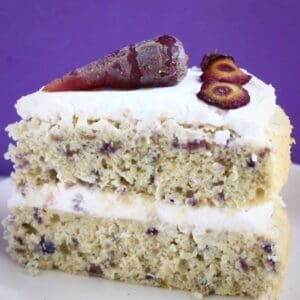 It’s easy to make and goes beautifully with the moist, fluffy sponge. 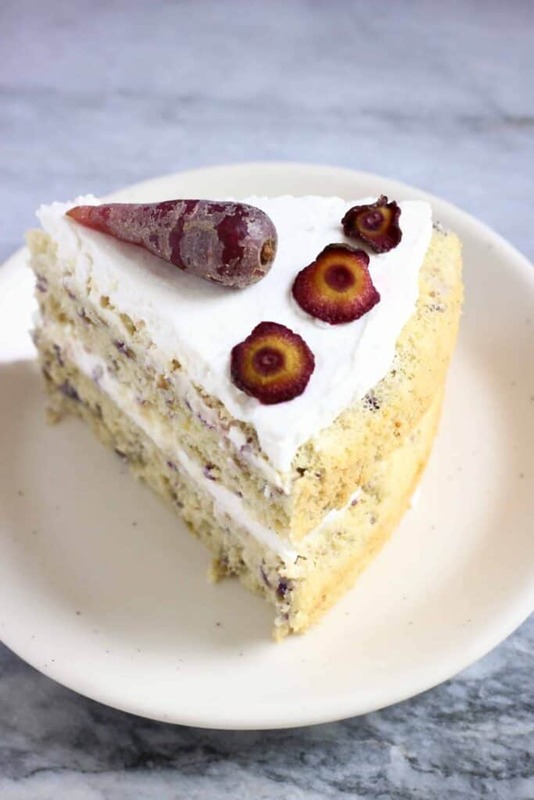 Finally, I decided to decorate the top of the carrot cake with some thinly sliced purple carrot crisps – although putting roast vegetables on cake may sound a little strange, the oven really brings out the sweetness in the carrots, and they look beautiful too! 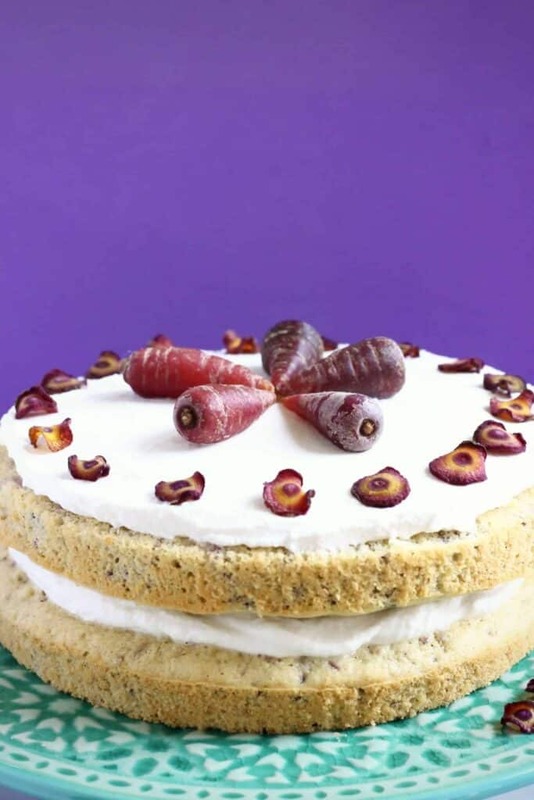 Again, normal carrots will work just as well for this, or you can leave them out completely and decorate the cake with anything else you like. 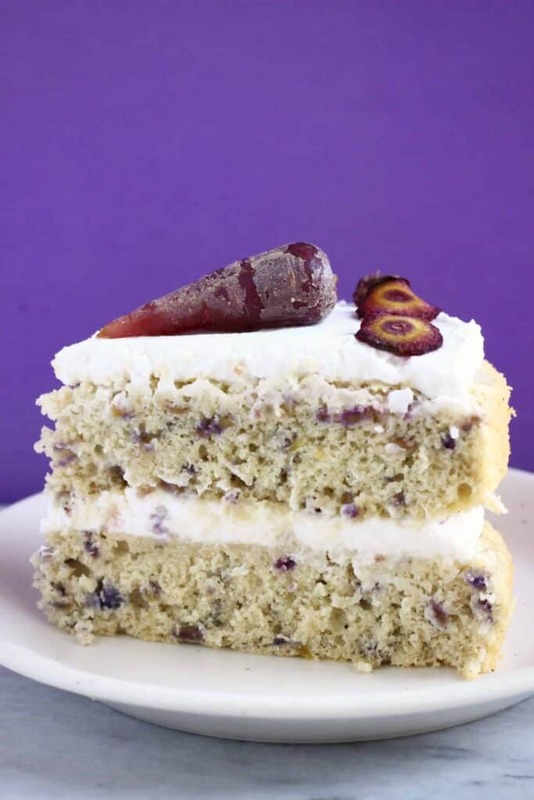 This Gluten-Free Vegan Purple Carrot Cake is pretty and colourful, naturally sweetened and slathered in a delicious cream cheese frosting! 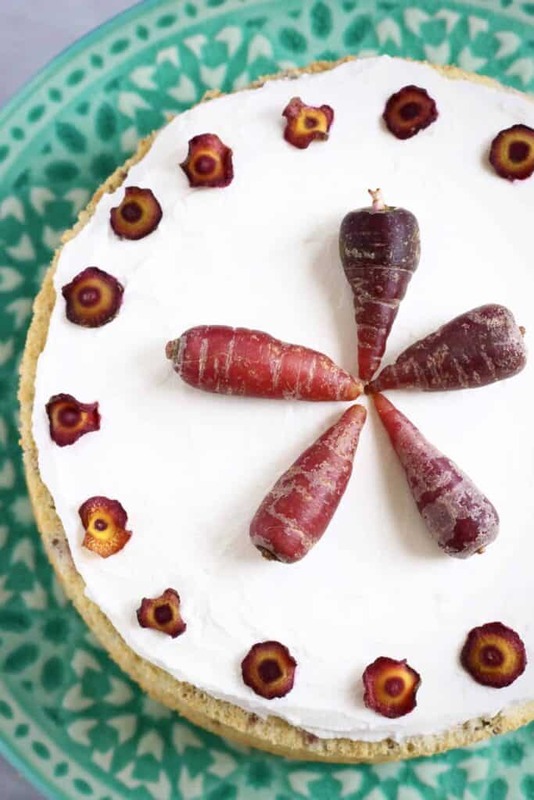 Lay out the purple carrot slices on a baking tray and bake in oven for around 10 minutes until the edges have shrivelled up - be careful to make sure they don’t burn! I am not a vegan person but I want to try it. This looks incredible! I have a friend who’s gluten-free and vegan due to intolerances but she’s also allergic to nuts – any suggestions for a substitute for ground almonds please? Thank you so much! The ground almonds can be substituted with ground sunflower or pumpkin seeds, or chickpea flour – the taste will change slightly though. Hope that helps! Are the ground almonds the same as just using almond flour? Which kind of gluten-free flour blend did you use in this? Yes same as almond flour! I used Dove’s Farm gluten-free flour, but rice flour would also work! Made this with normal carrots and it was delish!